Mary McLeod Bethune, a revered educator, once said, “We have a powerful potential in our youth, and we must have the courage to change old ideas and practices so that we may direct their power toward good ends.” A collaborative effort between the Arts & Science Council (ASC), North Carolina District Courts, Juvenile Courts and the Arts Empowerment Project brought Bethune’s words to life on April 19, as they unveiled student artwork that is permanently displayed on levels three and eight of the Mecklenburg County Courthouse. The artwork was created by students participating in Studio 345 – ASC’s free, afterschool, youth development program for students in grades 9-12, which partners with the Juvenile Courts. Students in Studio 345 use digital photography and digital multimedia arts to grow intellectually and socially, while gaining inspiration to stay in school, graduate and pursue goals beyond high school. The highlight of the display is a mural that replicates Studio 345 students’ artwork found in the NODA area. It was a collaborative effort from the students in the Say What You Mean to Say class of Studio 345, and it was led by their instructor, Kristin St. Martin – a CMS educator and professional working artist. 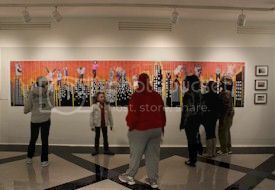 The public can see the mural by visiting the eighth level of the courthouse. The individual artwork can be seen by visiting the third level. While some students in the program are from the Juvenile Justice System, the majority voluntarily participate in the program. One of the voluntary participants is Trosch’s daughter, Pressley, who also participated in the unveiling ceremony and said her experience in Studio 345 has allowed her to pursue her passion in digital multimedia arts and gain meaningful relationships with her peers. ASC’s partnership with the Juvenile Justice System is part of a larger initiative to connect court-involved youth with pro-social extracurricular activities based in arts and culture to help them build self-discipline, communication and job skills, and ultimately, to divert them away from the Juvenile Justice System.